It was November 1st, 1991 as my hunting partner, Jack, and I searched the stubble field for sign, my heart sank. We had been tracking the whitetail buck for 3 hours and had lost the blood-trail about 10 feet into the field from the edge of the woods. I just knew we had lost the first deer I had ever shot with a bow. The week-long October hunt in the Birch River area of West Virginia had started on a less than auspicious note the prior Friday. I had left my home in Florida at 10:00 A.M. on Thursday and, after spending the night in South Carolina, arrived at camp at 1:00 P.M. on Friday to find that our cabin had been burglarized. We had been at the camp the previous May for spring gobbler season. Normally, we take all of our hunting gear with us. But this trip, we decided to leave quite a bit of it along with the usual cooking utensils, beds, heater, tools, and such. What hadn’t been stolen was smashed beyond repair. What a great way to start a hunting trip! Thanks to the good hearts and generosity of Abb and Clint Bragg, a couple of retired West Virginia natives, we were able to continue our hunt. The Braggs own a house at the confluence of 4 valleys which they allowed us to use for the week. Since Jack prefers turkey hunting rather than bow-hunting for whitetails, he spent the week turkey hunting and seeing deer all around his blinds. Naturally, I didn’t even see a tail let alone be able to get a shot at a whitetail. Needless to say, by the last day of our hunt, I was pretty discouraged. I took a ground stand at the base of an earthen dam built years earlier by a mining company. I sat there contemplating my bad luck, snapping a few scenic photos, whittling a stick, and basically feeling sorry for myself, never expecting to see a deer let alone a buck. At about 7:40 A.M., I heard something coming up the mountain to my left. I picked up my bow and stood facing in the direction of the noise. A few moments later, a deer crested the dam and appeared to be a 6 point. I came to full draw and followed the deer until he was broadside to me before releasing. The deer disappeared. I thought I heard the arrow hit, the deer fall, get up, and fall again, then silence. I gathered my equipment and walked to the top of the dam, about 9 yards, fully expecting to find the buck. There was no buck and no visible blood-sign. As I continued to look for sign, and to berate myself for missing such a close shot, I noticed the fletching of my arrow protruding from the grass about 10 feet BEHIND where the buck had stood. How could I have missed so badly? There were no obstructions to deflect the arrow. I pulled the arrow from the grass, discovering that the broadhead and 4 inches of the shaft were broken off and the shaft was covered with blood for about 15 inches. The buck must have fallen and broken off the shaft. When he got back up, I guess the arrow flipped around behind him. I had not found any sign and spent the next 1 ½ hour’s circle-searching the field below the dam before I found the blood-trail. Jack appeared on the ridge 100 yards below me and asked if I had shot a buck. I yelled back that I had and had just found the blood-trail. He had been turkey hunting several hundred yards down the mountain side and had almost been run over by the buck. It had left a good blood-trail, which we picked up from his blind. We spent the next 3 hours trailing the buck down the mountain towards our temporary camp. We jumped him 3 times, but I could not get a clear shot. The field where we lost the trail is bordered on one side by a small stream. On the other side of the stream are an abandoned trailer and a small country cemetery. We felt that the deer might have crossed the stream and bedded on the other side in a laurel patch. Jack stayed in the field to make sure the buck didn’t sneak out undetected. I walked through the field to the logging road at the base of the mountain and worked my way up about 50 yards to the cemetery. I carefully peeked over a small ridge to the flat on which the trailer stood. There was my buck! He was lying at the steps of the trailer within 150 yards of camp. It was a beautiful 8 pointer that grossed 117 7/8 inches and netted 116 6/8, almost perfect. After giving thanks for finding the deer and to the buck for giving himself to me, I called to Jack to let him know we had been successful. This deer will always be the most special to me no matter the size or number of deer I harvest in my lifetime. I can’t think of a better way to end a hunt, especially one that had started out as badly as this one had. Thx Ma. The deer ain't bad lookin' either, is he!! That's him in my sig pic. 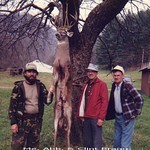 Not to mention that is a heck of a buck for WV especially at that time period. In that region, deer numbers were way higher than the should be for their health and that time period, we were hard on the buck deer too, shooting any buck with horns in any season was commonplace. Deer did not see maturity or attain good size. Great first! Thx. Real good, quality bucks were at a premium where we had our camps along Birch River in Webster County. That one came from on top of Thomas Mt. My buddy & I got these 2 in 2000. We did get several bucks in between but most were little 6 or 8 points. They both came from the mountain behind our 3rd camp, mine about 1/2 up & my buddies 8 at the top. It was 13 degrees with a WC below 0. I was withing 10 minutes or so of calling it quits when he showed up. Mine is the 10 point on the left. Nice. A little bigger than my first bow buck. Maybe even a lot bigger. Good looking deer! Bet the story was pretty good to. Speaking of bowhunting Webster County, WV- have you ever watched the movie called "The Hunted" from last year? Was based in Webster County. Pretty good movie, a thriller based on some bowhunters self filming trying to break into the outdoor industry. I won't say too much more, but you should check it out. Great read buddy, I felt as if I were there with you! I love old stories and pics like this. Every year right before bow season there'll be new bows that shoot way faster than last years models, broad heads that cut bigger holes and leave bigger blood trails, arrows that are stronger yet light enough to allow for faster speed bows, and each year I tend to wanna fall in that trap and do some upgrading. Then I see a post like this and it reminds me that long before all this technology folks killed deer(more importantly good bucks) with the equipment they had back then, and probably were a lot happier since life was easier without all these choices and marketing campaigns. Makes me feel good to see old stuff like this, it reminds me of a simpler time. Thanks for sharing. Alpha, Haven't seen it but will try to find it & watch. I have a book by Skip Johnson that tells all about the history of Birch River. A friend, Dee Kinslow, is mentioned for having killed the WV record black bear. If memory serves, it went over 600 pounds. Davisd9, I will try to find the story on the 10 pt but I don't think I wrote it up. Not mush too it though, I was on-stand about 5 A.M. & it wasn't long before I got really cold. About 7, I stood up & stomped my feet & swung both arms so they hit across mt chest trying to warm up. I repeated this at about 7:30. At about 7:45, I decided that, if something didn't happen by 8, I was outta there. About 10 minutes later, I spotted a deer walking straight towards me. I put the scope on him &, when he turned sideways at about 50 yards, I shot. He jumped & ran straight up the mountain towards me turning broadside at 10 yards. I shot him again & he went down. Turns out the 1st shot had taken out his heart & the adrenaline kept him going. I was fun getting him down the mountain with almost 2' of snow. He started sliding & I had a heckuva time keeping up with him. ole5beards, Thx I appreciate it. Glad you enjoyed my story. Times were certainly a lot simpler & easy back then. I think I may have some other "old" stories that I'll post from time to time. Great read and a beautiful buck. We never forget our firsts. Congrats on your first and thanks for sharing your story. I hope you guys don't mind me bringing up these older threads. There new to me and I'm really enjoying them. Thx. I plugged in the pics.